The Junior Section forms an active and friendly part of Knutsford Golf Club. The section is open to both girls and boys under the age of 18. We currently have about 30 junior members. Knutsford Golf Club is a safe and enjoyable environment for Junior golfers to flourish and we welcome new members. Please contact the Club Secretary John Horsley on 01565 633355, or by email at secretary@knutsfordgolf.com for further details. The Junior Section is organised by the Club Professional Tim Maxwell, and his wife Suzy Maxwell. Prospective members are invited to an informal chat with the organisers, who will explain details of membership, and how the Club is organised. Junior coaching is available from our professional Tim Maxwell. Three scorecards will then be required to obtain an official handicap. 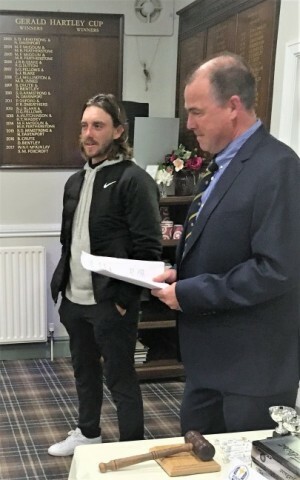 In 2016 and 2017 Graeme McDowell presented prizes and shared stories with our Juniors at our end of season presentation, and in 2018 Tommy Fleetwood presented the prizes and introduced our new Junior Captain Keiran Comboy. Major competitions include The President’s Prize, Captain’s day, Lady Captain’s day, Secretary’s Prize and the Professional’s Masters. Our Knutsford members also kindly sponsor our Sunday competitions. Team Competitions : The Club has been successful in various team competitions — including The Williams BMW Match-play competition (in which 100 clubs in the Manchester area compete) and the Mid-Cheshire Junior League (MCJL).